A Signature member of The Oil Painters of America and The American Society of Marine Artists, Farnsworth’s paintings have appeared in many national shows, museums, and private collections throughout the United States. 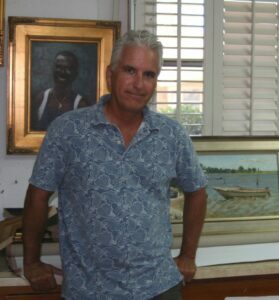 A prolific Gallery painter, Bill has seamlessly moved into the Fine Art field where he has garnered awards of excellence from the Oil Painters of America 2006, 2007,and 2011 Eastern Regional shows and the 2007 National show. Farnsworth was featured on the PBS TV show “Gulf Coast Journel”Hosted by Jack Perkins. He will be featured in a book entitled “100 Southeast Artists” due out in 2012. His work is represented by The Hughes Gallery, JM Stringer Gallery, The Courtyard Gallery of Fine Art, Anderson Gallery of Fine Art, and John Collette Fine Art. Bill currently lives in Venice, Fl. with his wife Debbie.